It seems that darling little A is less and less willing to eat purees these days. She seems to only be interested in foods that she can put into her mouth with her own two hands. If a spoon approaches her mouth now, she grabs for it & pulls the contents off. She then either tries to put it in her mouth, or rubs it on the high chair tray and then in her hair. While I applaud this little bit of independence, it leaves me wondering two things: What do I do with the meticulously-portioned cubes of frozen veggie purees in the freezer, and what on earth do I feed a ten-month-old to ensure she’s getting a balanced meal?? I know that “Food before one is just for fun,” but I also want her to try lots of flavours and get used to different types of foods. Hubby is a picky eater, and I want her to have an open-minded palate. Some hits so far include apple slices softened in the microwave, a grilled cheese cut into small pieces, French toast with banana blended into the mix, and well-cooked cauliflower. Some misses include chicken meatballs (fun to tear apart, not so much to eat), mushy carrots (she liked them pureed), and cooked peas with the skin pulled off (possibly just too small). This leaves me on the hunt for recipes appropriate for a ten-month-old with only her two lower incisors for chewing. There are resources for baby-led weaning online, so that’s where I’ll start. Have you gone through this with your little ones? What foods did your independent eater enjoy? “A” is for “All over my face.” Sweet potato, back when purees were cool. 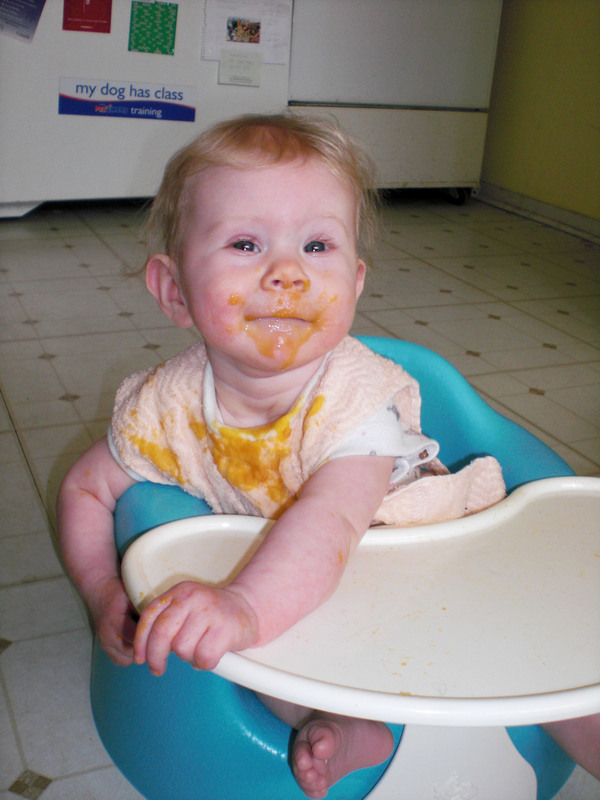 This entry was posted in Food and Nutrition and tagged baby-led weaning, finger foods, independence, picky eaters, purees on November 23, 2013 by lovelaughlaundry. lovelaughlaundry on A single step. Jeyna Grace on A single step.